Tap tempo can be a little confusing. EHX has an enviable delay pedigree: The Edge is as synonymous with his Deluxe Memory Man as he is his beloved beanie. The Canyon marks the company’s first compact, multi-mode offering. Until now, Boss and TC Electronic had this market sewn up, but this all-encompassing stomper looks like a challenger thanks to a host of savvy features. The New York maestro has pulled together 11 delay types, from the DMM to the expected tape and mod types, as well as more esoteric offerings, including the pad-like shimmer, glitchy sample and hold, and octave - where the pitch of each repeat rises by an octave. It’s worth noting that pitch-shifted types like this aren’t available on compact delays in this price range; we can hear post-rockers clearing space on their ‘boards already. We should also mention the 62-second looper - complete with undo/redo and stop-start can store your recorded loops even when the pedal is off. There’s onboard tap tempo and a sub-division switch to dial in those dotted eighths. Nearly every delay type has secondary functions, accessed by holding the tap/divide switch for a second; now the delay and feedback knobs control type-specific parameters, such as rate and depth for modulated settings, or sub-octaves on the octave mode. It’s a bit of a mind-bender, but the Canyon stores the secondary setting tweaks you make to each type, so it can be used as a set-and-forget-type deal - that said, we’d have preferred instant access to these parameters. The pedal’s tap tempo is also a little bewildering in that it’s always active: switch the Canyon on and off a few times and you’ll tap in a tempo. You can disable it and plug in an external tap tempo switch should you wish. 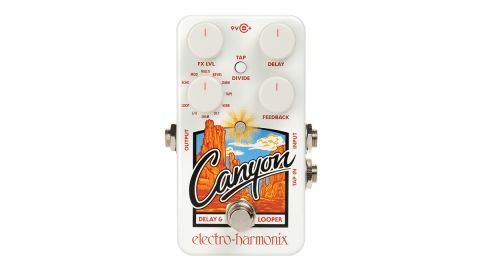 The Canyon is unmistakably EHX in every way, for better and for worse. Keep the manual close as there’s a vast chasm of delays to explore. The audio quality and diversity should make this a no-brainer for experimental players whose compact needs aren’t met by the DD-7 or Flashback and don’t need stereo outs.